I’m back with highlights from my summer trip to lovely Lyon, France. This time I’m going to take you on a wonderful walking tour of Vieux Lyon, also known as Old Lyon. Vieux Lyon is known as the Old City. 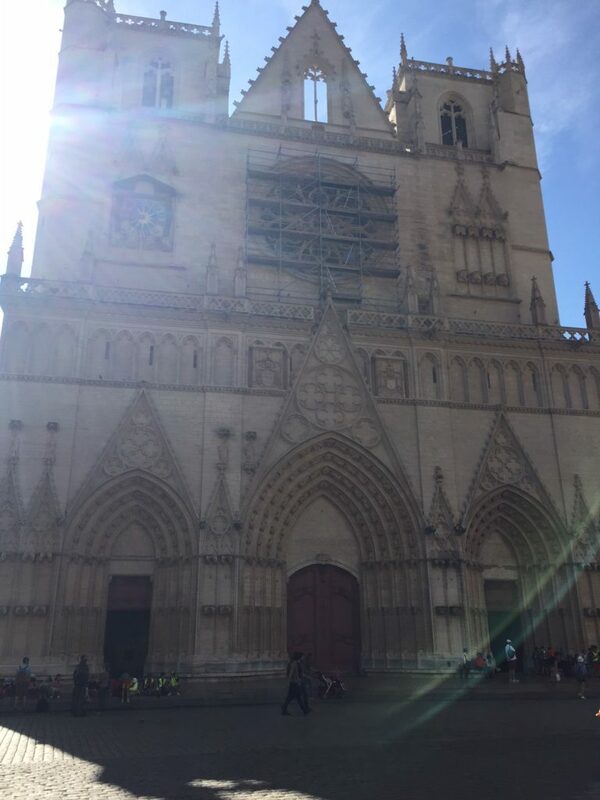 Our two hour group tour began in Place Saint-Jean, the square in front of the Gothic St. Jean Cathedral. Before going inside the Cathedral, our guide Paul pointed out Notre-Dame Basilica, atop Fourvière Hill, which was in perfect view from the square. “This is where the city was founded by Romans in 43BC,” said Paul. He suggested we take the funicular up the hill where you can see the church and the old Roman theaters. Unfortunately, we didn’t have a chance to experience the ride. It sounds amazing, especially at night with the lights. 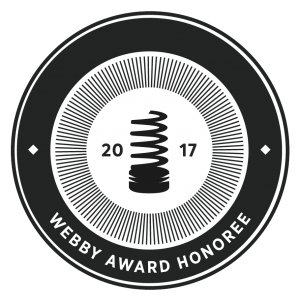 More reason for a return visit. Notre-Dame Basilica is high atop Fourvière Hill. Paul provided a history of St. Jean Cathedral. 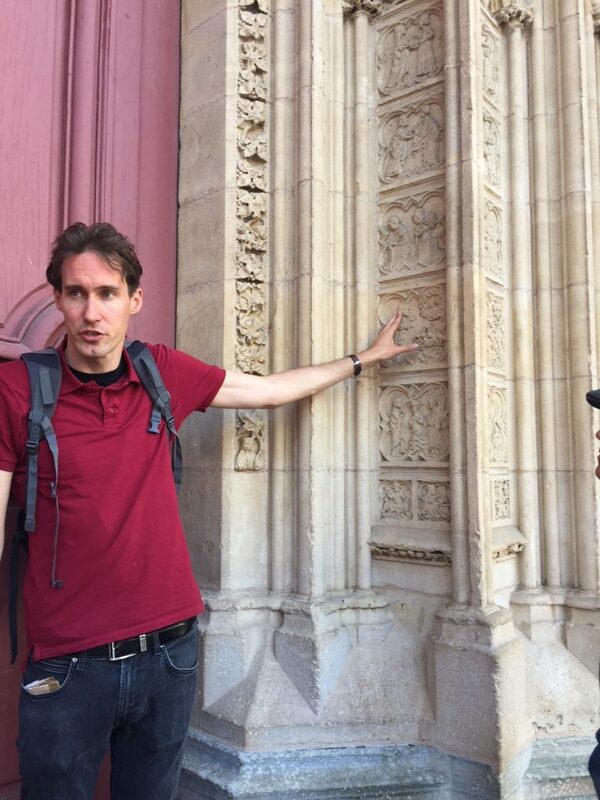 “It took 300 years to build this church,” he said while explaining details about the panels along the facade. Each panel tells a biblical story including the tale of Adam and Eve and the tree of wisdom. St. Jean Cathedral is locate in Vieux Lyon. Our guide Paul told us about the biblical stories carved into the facade. Even though it was in the middle of being cleaned, the interior of the Cathedral was quite magnificent with baroque-style paintings on the walls, 13th and 14th century stained glass above the altar and halls, and a medieval astronomical clock dating back to 1383. Sadly, Paul said the clock was currently broken. 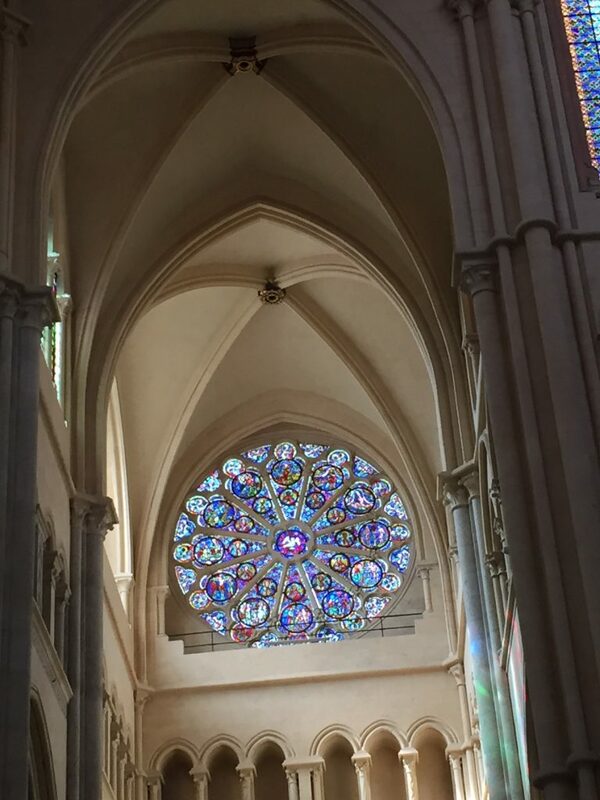 Stained glass adorns the halls in St. Jean Cathedral. 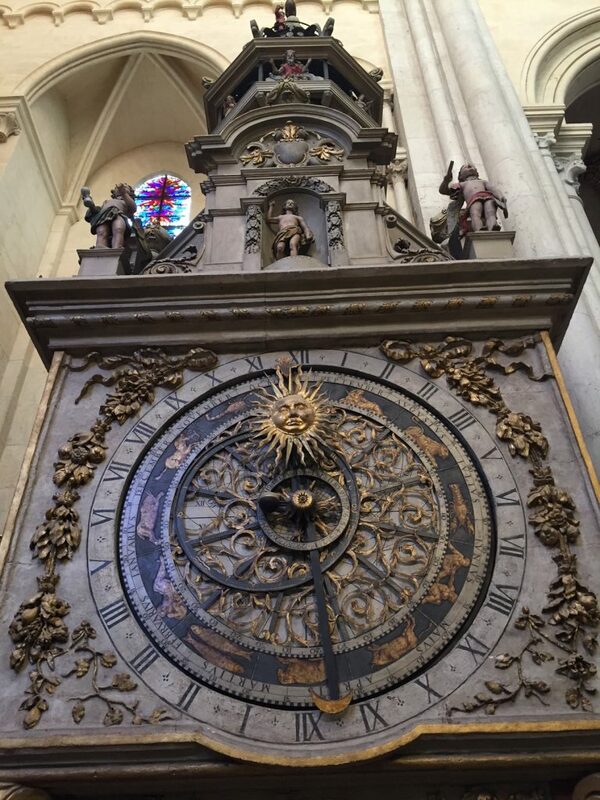 The astrological clock stands out in St. Jean Cathedral. Lyon is situated along the Rhône and Saône Rivers. We passed Michelin-rated restaurants and learned about Lyon’s culinary heritage. “Lyon is the culinary capital of France,” said Paul. He described how the Michelin Guide originated. 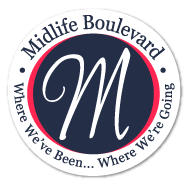 “People from the Michelin tire company traveled around and wanted to know where to eat,” he said. There are a few Michelin Star restaurants in Vieux Lyon. 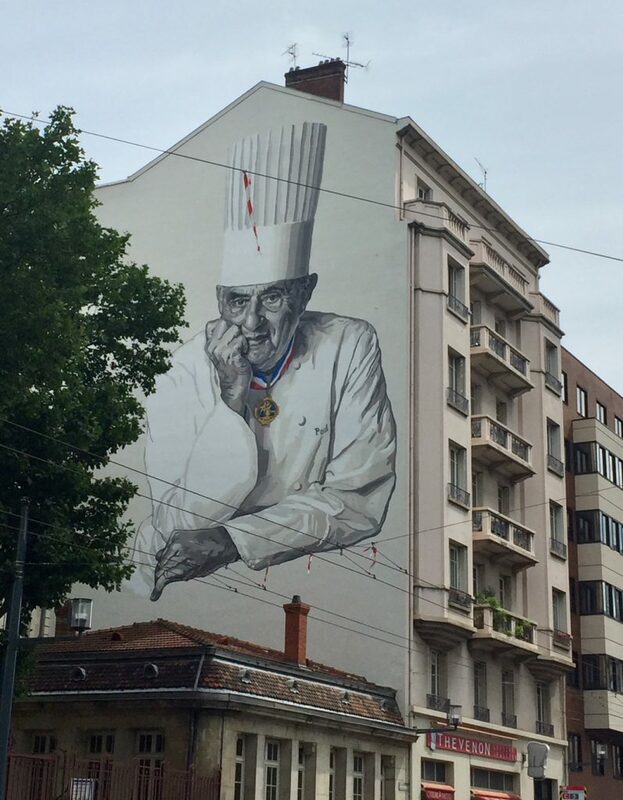 The late Chef Paul Bocuse is the father of gastronomy in Lyon. 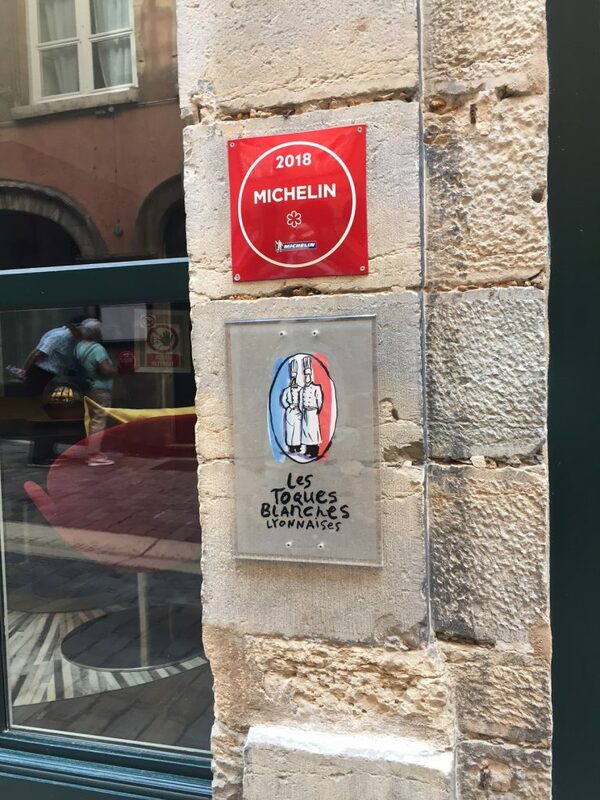 Paul indicated that there are several Michelin-star restaurants in Lyon, but the only restaurant with 3 stars is that of the late Chef Paul Bocuse, known for being the culinary king of Lyon. L and I did not splurge and eat at Bocuse’s restaurant. Another reason to return to Lyon. Maybe when we hit the lottery! 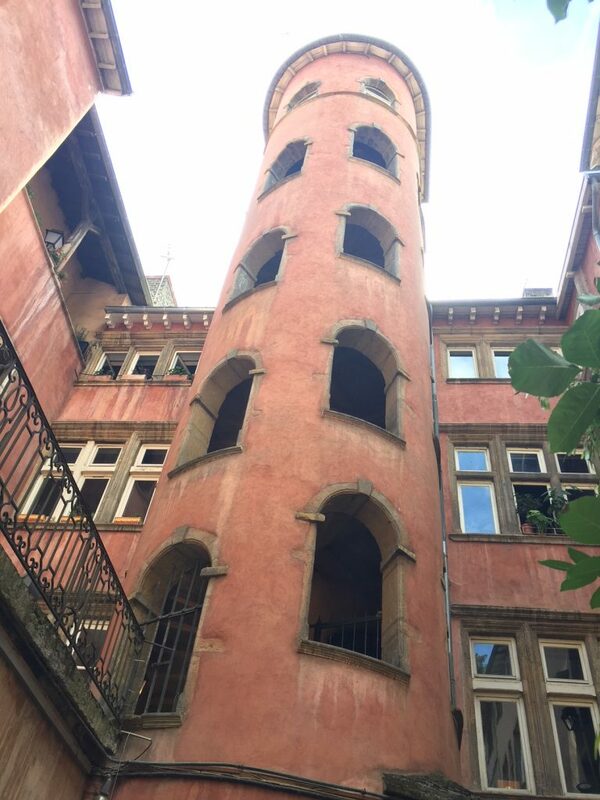 One of the highlights of Vieux Lyon are passageways, called traboules, hidden between buildings. Some are shortcuts to the river, others to the town’s main streets. Paul told us that during WWII traboules were used as hiding places for French resistance efforts. He also noted that if we wanted to learn more about traboules to check out the traboule app for smartphones. 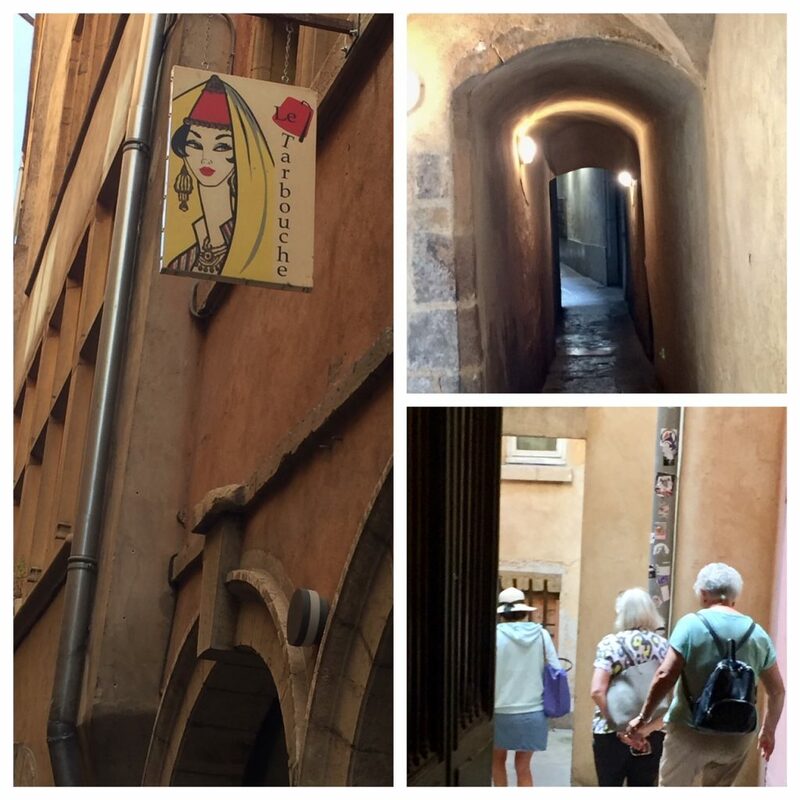 When in Vieux Lyon you must walk through the traboule passageways. 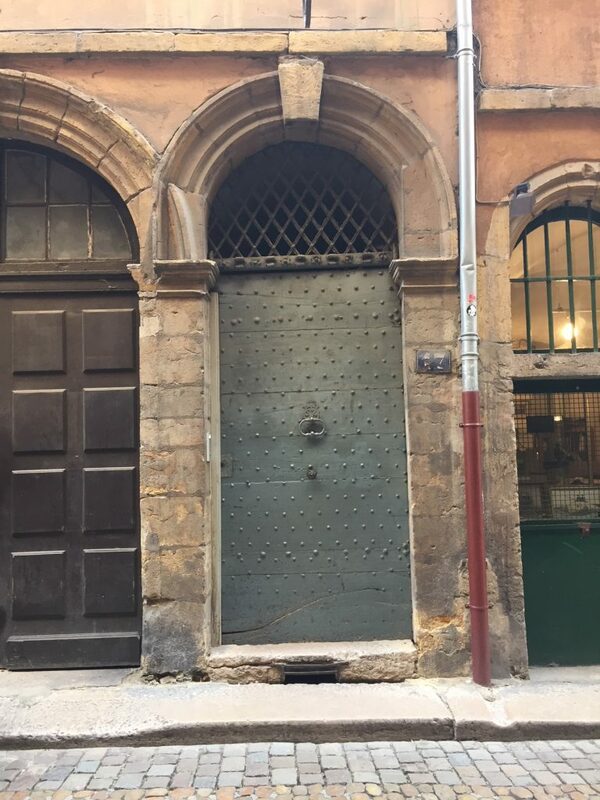 Behind Lyon’s closed doors are hidden passageways. Wandering deeper into Vieux Lyon, brought us to Place de la Basoche. Its coral-colored Renaissance building and courtyard are often pictured in photographs and paintings of the Old City. The Musee Des Miniatures Et Decors De Cinema is located here. The building is one of about 300 old buildings remaining from the 15th century protected by the UNESCO. Place de la Basoche is an icon in Vieux Lyon. We passed a street with a theatre and acting school. “Lots of Artisans are here,” said Paul. We saw some of the drama students waiting for class. Each venue had a Code of Arms. 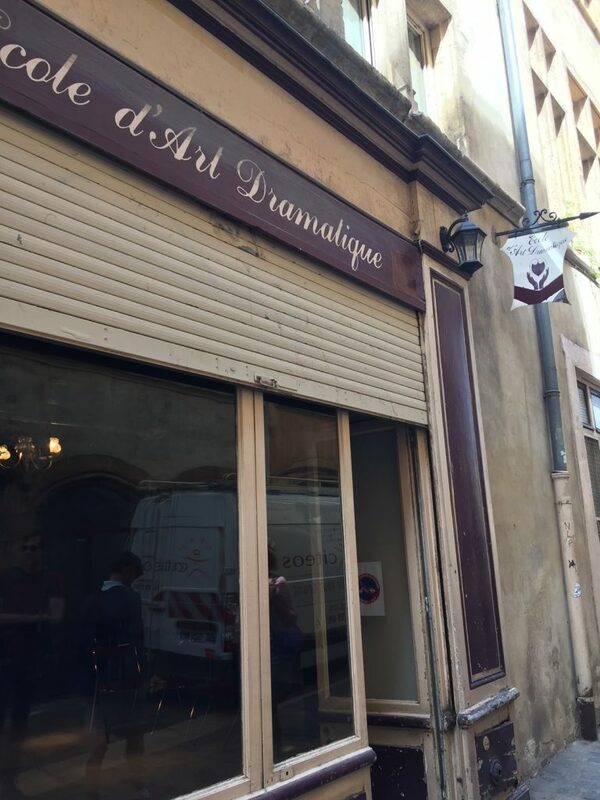 There is an artists community in Vieux Lyon, including an acting school. Vieux Lyon is also home to the art of puppetry. 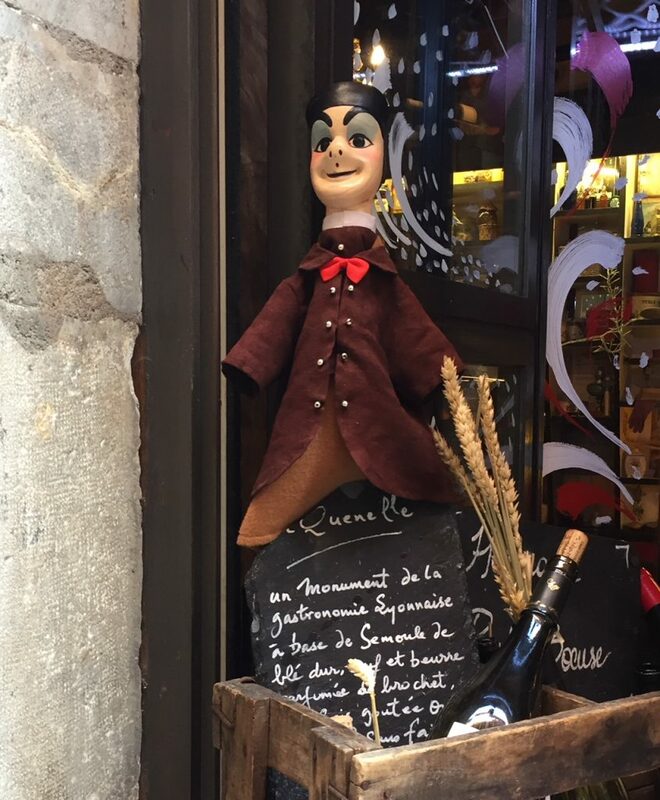 The most popular puppet is Guignol and you will see him in souvenir shops and paintings throughout Lyon. L and I weren’t a fan. We both thought Guignol puppets look kind of scary, however we did find the story of his creation quite amusing. Paul said that Guignol’s creator, Laurent Mourguet, was an unemployed silkworker who started to practice dentistry. According to Wikipedia, most dentists in the late 1700s in France simply pulled teeth. To attract patients Laurent created a puppet show. The puppet was so successful that dentistry fell by the wayside. We didn’t have a chance to visit the Musee Gadagne which includes the Lyon History Museum and the Puppets of the World Museum. Will have to save those two for another trip. The most popular Lyon puppet is Guignol. 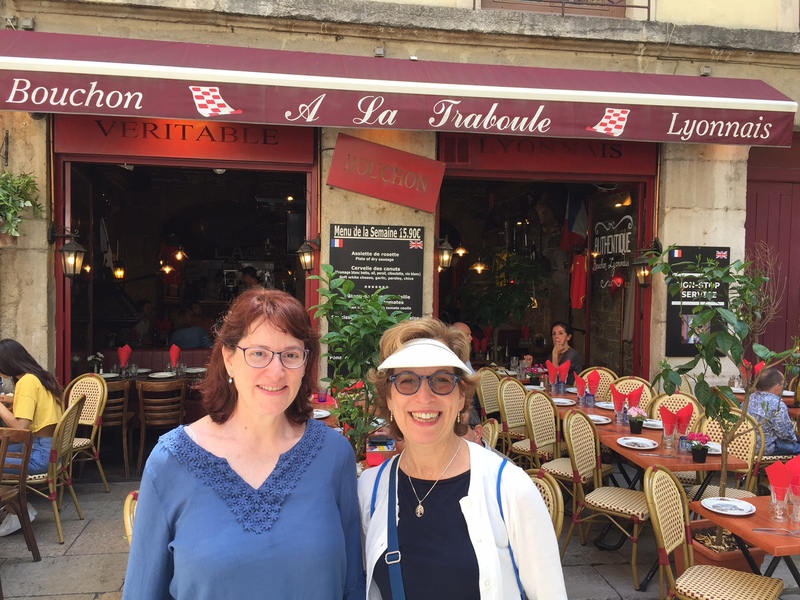 L and I dined at one of the local bouchons in Vieux Lyon. Thankfully, L understood the French menu so we didn’t order any intestines. I did try quenelles which are a Lyonnaise favorite. My quenelles were made with fish and served in a creamy sauce. They reminded me of dumplings without the skin. They were so good, so good, so good. L and I ate at a local bouchon in Vieux Lyon. 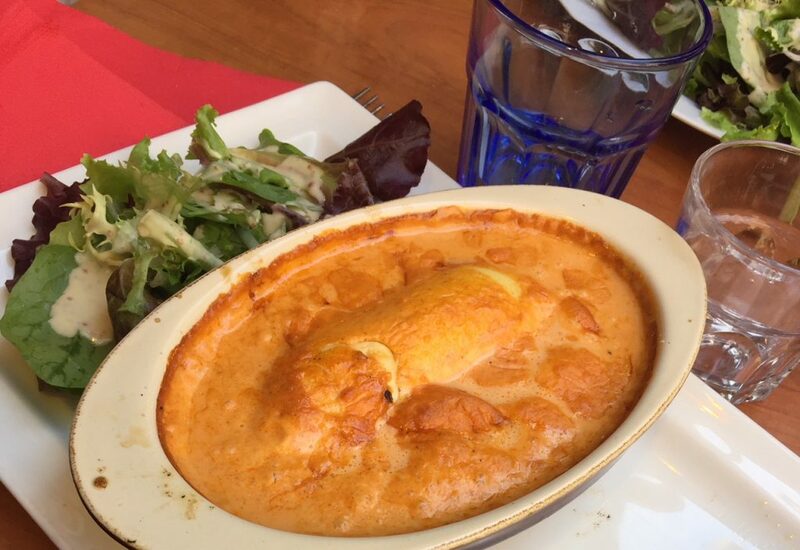 Quenelles are a Lyonnaise cuisine specialty. Au revoir mes amis. I was sad to leave Lyon and know I will be back one day. I adored this city and encourage you to visit. 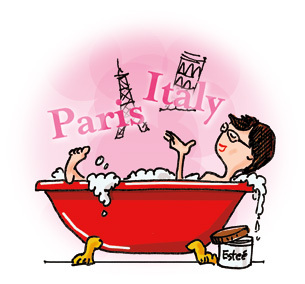 Oui mes amis, we’ll be in Paris soon. A food and city tour of Montmartre awaits. Fabulous pictures, am using to plan a visit. Thanks for your positive comments Antoinette. Hope you enjoy your trip to Lyon. Trips with your fav gal pals are always the best! 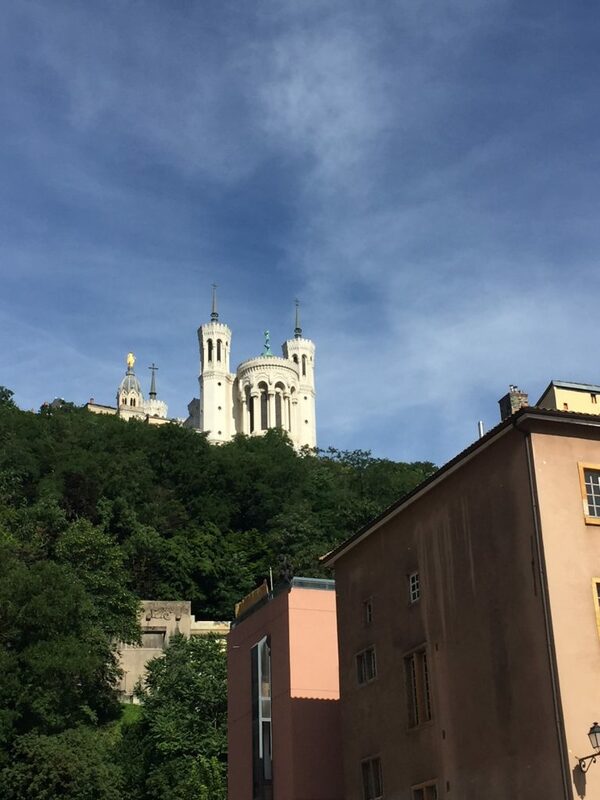 It looks like you had a terrific time in Vieux Lyon. That astrological clock must be something to see! 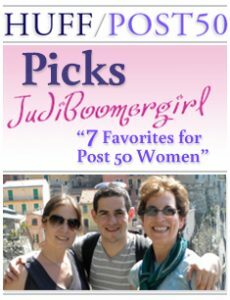 Thx for the great post, Judi. 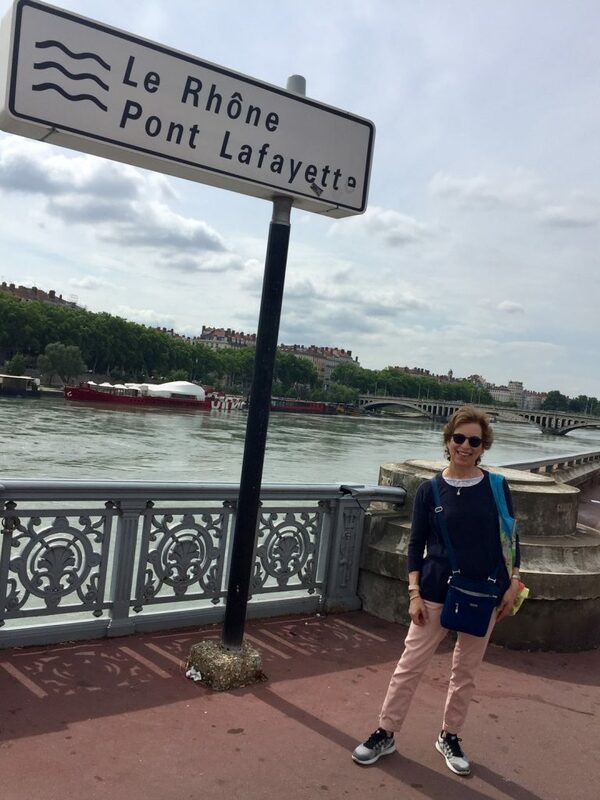 Doreen, it was my first time visiting Lyon and I found it to be a truly magical place. Definitely want to return someday to see more. The next best thing to visiting Lyon = Reading about someone else’s visit and looking at the photos! Irene, you are the expert on Lyon. 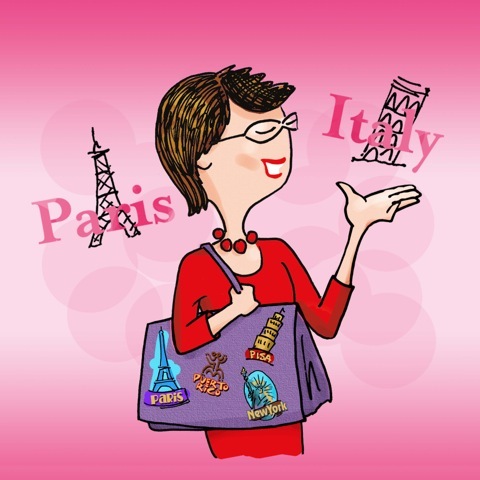 Thanks for all your tips on what to see and do. 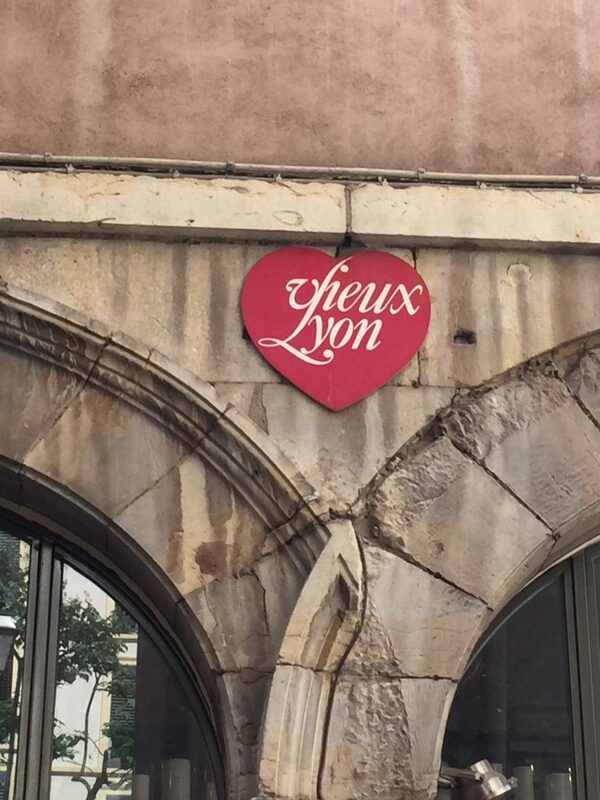 Kemkem, hope this post inspires you to visit Lyon. I think you will enjoy it. I haven’t been to Bordeaux but it’s on my travel list too. A reminder that I need to get to some of those old French cities. 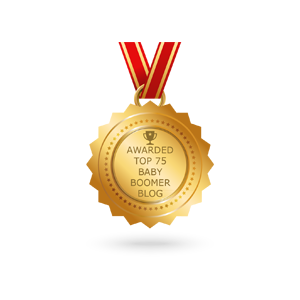 Food, history and the Romans – a winning combination! Karen, yes, yes, yes, the food is almost as good as Italy. I’ve been to Lyon several times while visiting friends in France, but I’ve never taken a tour. The history is always something I gravitate to and Vieux Lyon is an enchanting place to learn it! Marilyn, I highly recommend this tour, especially since it is just the cost of a tip. It’s useful to learn about Vieux Lyon’s history from someone who is more knowledgeable.